Check it out guys, we are now on Pinterest! Forgive us, we are a little new to this whole Pinterest thing. Just click the picture above and pin away. Pin some of our pins to your board this winter then visit us and see it all for real! What do locals like to do in Destin? 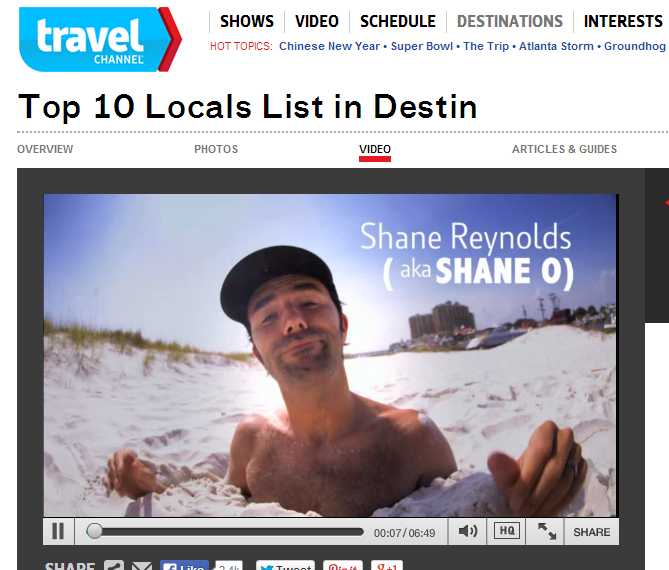 Check out this video from The Travel Channel, “Top 10 Locals List in Destin” Thanks Shane O for the plugs, hope you had fun!! You bet #1 on the list is to go parasail and rent jet skis from Xtreme h2o Sports!! Want to experience all the fun for yourself? Click on the links https://www.xtremeh2o.net | https://www.xtremeh2o.net/parasail.html | http://www.destined2parasail.com Check us out today! Happy Veterans Day From 'Ol Glory! Happy Veterans Day from Everyone at Xtreme h2o! We show our respect everyday flying our custom designed red white and blue parachute we call Ol Glory! Head over to https://www.xtremeh2o.net and http://www.destined2parasail.com for more! XTREME Waterspout Caught On Film! !